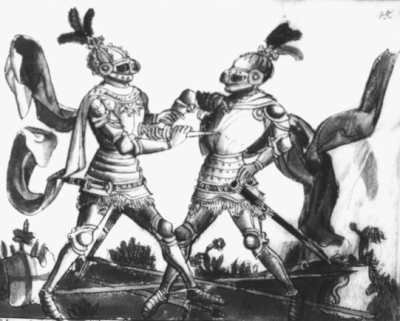 Not a fencing treatise, but provides valuable insights on period arms and armor. Not a fencing treatise, but contains valuable descriptions of viking fighting techniques. Not a fencing treatise, but contains wrestling images. Not a fencing treatise, but contains images of sword and buckler play. 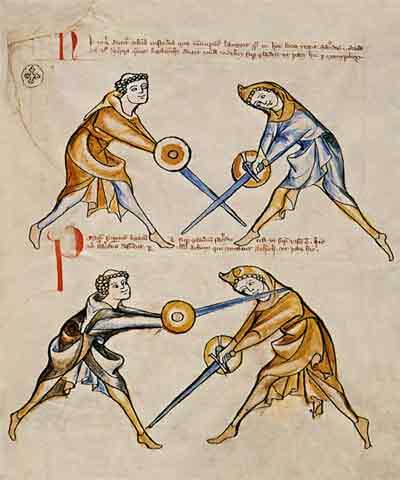 Not a real Fechtbuch, but contains images of fighting knights, therefore, due to the rarity of period fighting manuals, it is of valuable information to historical european martial arts practicioners. A very early copy of the ancient work by Vegetius. Johannes Liechtenauer is the most important person of German medieval swordsmanship. His original work is lost. Alternative title: Nürnberger Handschrift GNM 3227a. Sometimes referred to as Döbringer Hausbuch, because the name Hanko Döbringer appearing in the codex. However, Döbringer may not be the author of this book. It contains commentaries to Johannes Liechtenauer's (and other masters') glossa, presenting techniques with longsword, dagger, staff, shield, Messer and wrestling/grappling as well as recepies and magical techniques. Alternative title: "The Man Who Wol"
An English manuscript dealing with great swords. Dedicated to Niccolo III d'Este, Marquis of Ferrara. Size: 28x20.5 cm. A work in Italian. Contains wrestling, dagger, longsword, lance, poleaxe techniques, with and withour armour, on foot and on horseback. There are four survining copies known (Pisani-Dossi, Getty, Morgan, Florius). Fiore himself has studied from German masters, for example a Swabian master named Johannes. The Getty and Pisani-Dossi versions are dedicated to Niccolo III d'Este, Marquis of Ferrara. Mostly a copy of Bellifortis by Konrad Kyeser, also contains some Talhoffer material. Sometimes referred to as "Gladiatoria". Filippo (or Lippo) di Bartolomeo Dardi was a fencing master of the Bolognese School from 1413 at latest. Besides teaching swordsmanship he studied astrology, astronomy and mathematics; around 1434 he earned the title of Professor of Geometry at Bologna University, as a recognition of this since then lost work, which focused on the relations between fencing and geometry. Currently resides in Biblioteka Jagiellonska, Krakow, Poland. Previously in Berlin, Preußische Koenigliche Staatsbibliothek. The erliest known manuscript of Hans Talhoffer, with 178 images and 41 pages of text. Formerly in the Ducal Library of Gotha. A French work on the poleaxe. Previously located at Gotha, Forschungsbibliothek Schloß Friedenstein. This supposed manuscript is actually KK5013. The connection has been made by Dierk Hagedorn. Master Ott is the main figure of 15th century wrestling. No treatises survive from his hand, but his system can be learnt from various other surviving Fechtbücher. 46 images without text, probably from Southern Germany.